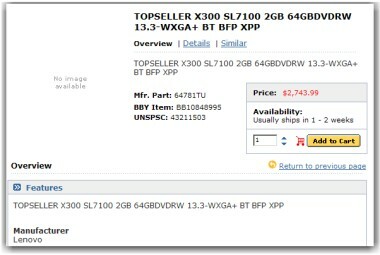 Looks like Gizmodo was right – the Lenovo ThinkPad X300 does exist, as evidenced by a Best Buy page. What’s surprising is that it will be sold through Best Buy (with a shipping date of 1-2 weeks) – there have already been discussions on the Notebook Review forums about models/specifics. This will be a similar form factor to the MacBook Air, just with an internal optical drive (that can bump the weight up from 2.5 pounds to 3.2 pounds). Most of those specs were reported by Gizmodo, and this just confirms them (although it helps that it gives a model number and a CPU model). Thanks to the several different people who sent the BB page in to us (Allan was first). 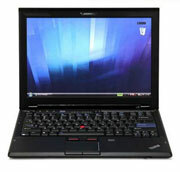 This entry was posted in Announcements, IBM/Lenovo, LED Backlighting, Rumors. Bookmark the permalink.